I got bitten by the dirt bug last summer when I joined adventure rider and film maker Austin Vince on his Mini Mondo trip to the Pyrenees. As a novice off-roader I wobbled and crashed my way through the week, but even though I found it hard, I enjoyed every moment of it. I was hooked, and I wanted more! 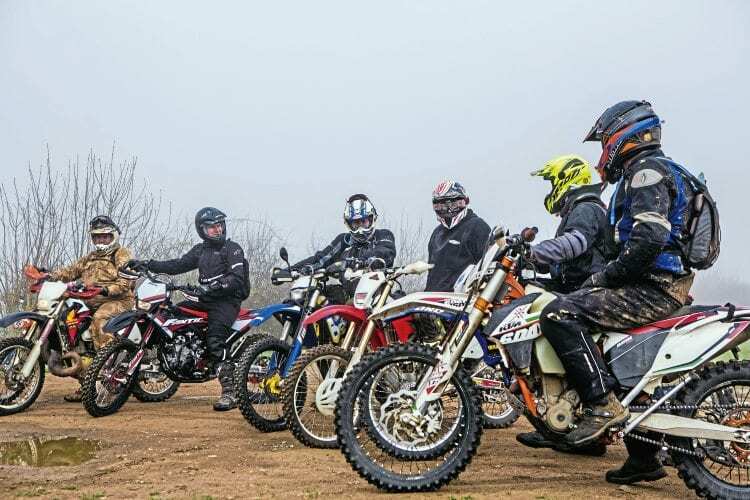 Back in the UK, I didn’t really know where to start with trail riding, never having paid much attention to the off-road scene, but I remembered hearing about the TRF, the Trail Riders Fellowship. I didn’t know much about the organisation, but the name had a certain ring to it – I wanted to be a part of the fellowship. On closer inspection, the TRF seemed to be the perfect place to start not only do they promise to introduce their members to the best local trails through their network of local groups, but they also work to keep the network of green lanes open at a time when lanes available to motorcycles are closing at an alarming rate. I hovered my finger over the ‘join now’ button on the TRF website for a moment and then pressed firmly. A few moments and £45 later I was a full member off the fellowship. High road or low road? Choose your path and stick to it. As I was keen to get on the trails, I contacted my local group straight away to find out how I could start to make the most of my membership as soon as possible. Joss from the Lincolnshire TRF group got back to me quickly and asked me to come to the next monthly club meeting, we’d take it from there. Eager to get on the lanes, I pressed him about any group rides coming up, and sure enough, they always went for a ride a couple of days after the meeting. I would be more than welcome to join. So far, so good. At the meeting Nev also went around collecting £2 donations to the TRF’s ‘fighting fund’ from the members. This is money that is used for legal fees when the TRF fights to keep old roads and byways open for motorised two-wheelers. 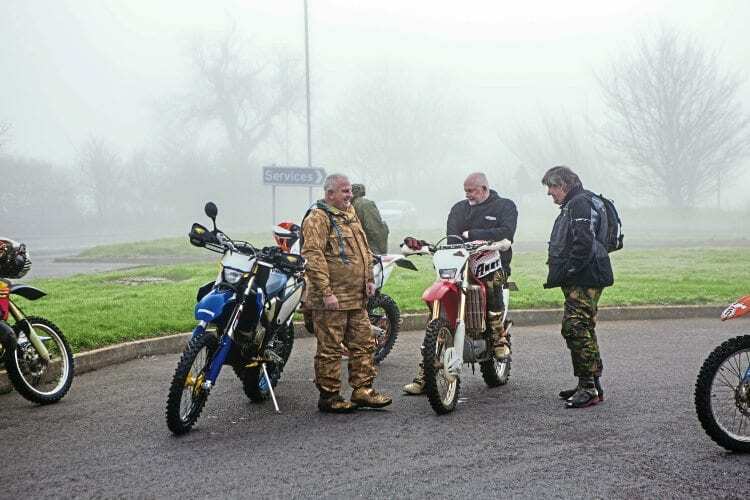 The first challenge of the day was to find the other riders in fog-bound Grantham. I couldn’t quite envisage this road with special grass in my mind, but it sounded like the TRF was a force to be reckoned with when it came to fighting the trail riders’ cause. There was just one problem. I didn’t actually have a trail bike. I looked into buying one, but I would have had to sell my Yamaha FZS 1000 Fazer first to raise the money, and that was not going to happen in time for the ride. Luckily the good folk of Fantic stepped up to help, and offered me a Fantic 250 Casa on loan, so I could get started. The Fantic 250 E Casa is a 250cc, single-cylinder, four-stroke machine, aimed at trail riders. It’s very light (104kg dry) and agile, and for someone like me who’s used to road bikes, it sounds extremely tall with its 915mm seat. Luckily, when I sat on the bike the tall suspension compressed enough for me to get both feet on the ground. The Fantic 250 E Casa, comes as standard with lights, indicators and horn, so it’s road-legal, and ideal for trails. When I went for a little shakedown ride before the main event, the bike felt instantly manageable and confidence-inspiring. The electric ignition makes life easy if you stall the bike as often as I did, and the predictable and wide power-band helps keep things under control. I had a great time with the bike on some easy local lanes that I found on the Byway Map (www.bywaymap.com). Now that I was comfortable and confident with the bike, I was really looking forward to the ride with the TRF guys. Bikes lined up ready to start the day’s riding. Still looking pretty clean at this point. I started at a tentative pace, trying to concentrate on the road ahead rather than the obstacles right in front of me, and somehow I managed to stay upright through the tricky bit. As the lane got better, my confidence grew, and I started to pay a bit more attention to how the bike was moving below me, and not just hanging on for dear life. 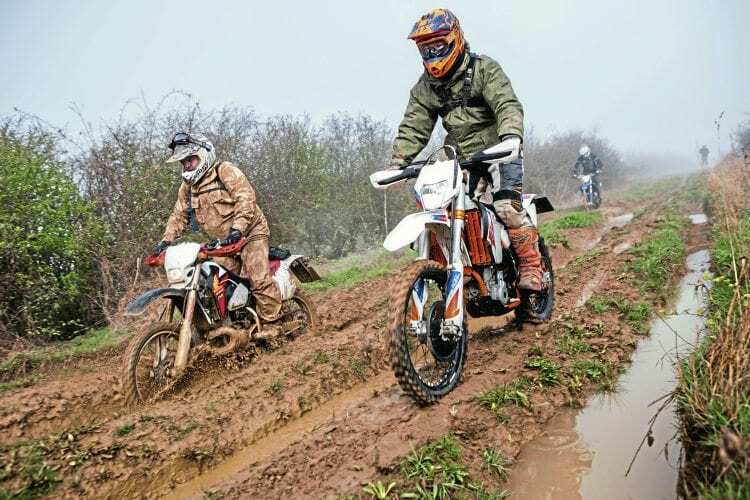 I was amazed how well the knobbly tyres gripped on the muddy and grassy ground, making it easy to steer the bike. Every now and again there was a little slide or wheel spin, but then the tyres found purchase again and the panic was over. Behind all the mist there’s a green lane, bikes and a lot of mud. 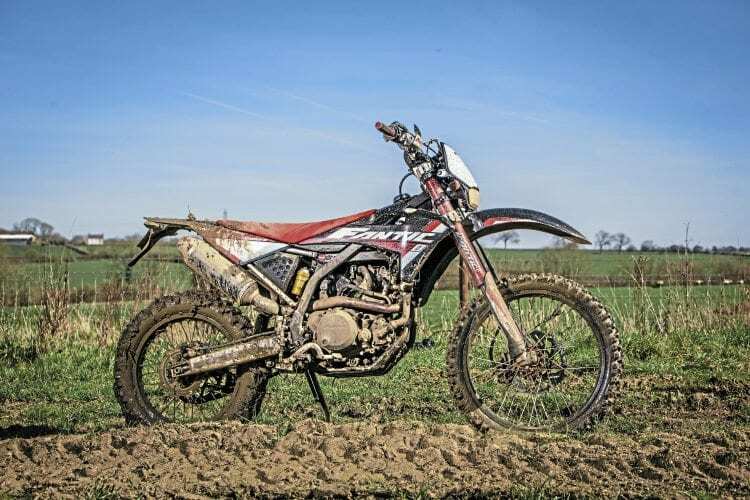 I was also starting to appreciate how well suited this 250cc bike was to a novice off-road rider like myself: it had enough poke to get me out of the ruts and puddles that I got myself into, but not so much power that giving it a handful would throw me off it. The big bear claw pegs were easy to stand on, and even with my big and heavy off-road boots, I could still easily control the gear and rear brake levers. After an hour’s riding we got to the place that Nev had mentioned at the club meeting: the lane closed because of the rare grass growing on it. It was a nice wide lane that had probably once been an unsurfaced road, but was now covered in grass. I couldn’t tell how special it was, but there was lots of it. Mikko and Nev take a break to admire the special grass that’s caused a lane closure. This is the sort of thing that the money collected for the `fighting fund’ goes on. Seeing the forbidden lane made the whole issue feel a lot more real. We sat by the start of the lane for a while, thinking of what might have been. End of the road. 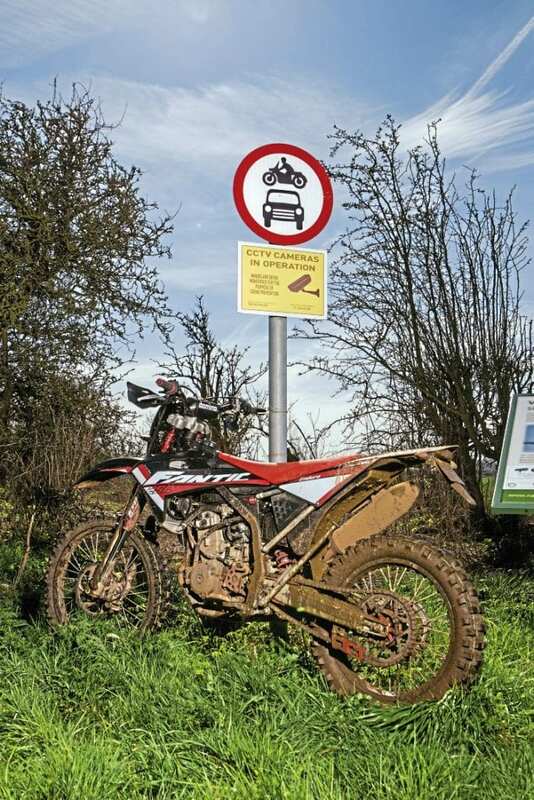 Motorised vehicles – you shall not pass! Luckily there are still plenty of great lanes to ride, and the TRF intends to keep it that way. We headed out on one of them, en route to a spot of lunch. By now I was riding with a lot more confidence and really enjoyed the lanes. I wish I could tell you where we were, but the truth is I have no idea. All I know is that the ride started and ended in Grantham, and that Belvoir Castle was in plain view at one point. And that’s the great thing about the TRF guys, they are not only great riders, but they also know all the lanes on their patch like the back of their hands. There was not a map in sight, and we never took a wrong turn all day. After lunch we were on the home straight – if by straight you mean a long and winding network of lanes of all descriptions. 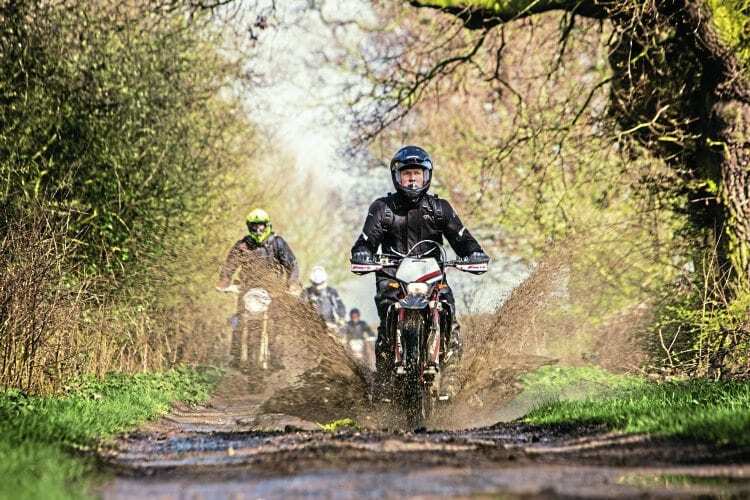 We rode over mud, gravel, grass and even up a stream – the variety of tracks was impressive. When the going gets tough, the tough had lunch. Not being used to riding standing on the pegs, my legs were getting tired by the end of the day, and my clutch hand was starting to ache from having to use the lever a lot more than you would on the roads. 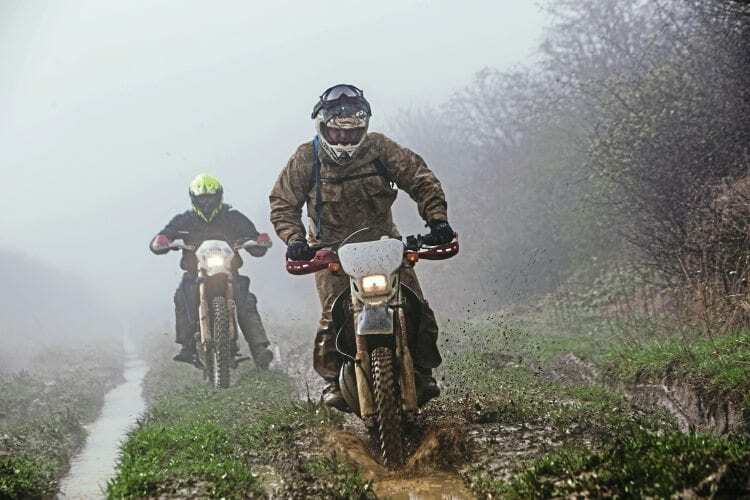 As the ride drew towards its conclusion we were also riding a lot faster as I learnt to trust the bike to find its way through the ruts and puddles and stopped fighting it so much. The less I tried to wrestle the controls the easier the riding got -I’m still an absolute beginner, but I felt that just a day out with the group had improved my riding no end. And best of all, it had been a real giggle – I loved every minute of it. The magnificent seven, and a novice, line up to ride another lane. As the ride finished, we passed the same crossroads where I had looked at the ruts in horror in the morning. I didn’t see anything scary now. I had done much more demanding sections during the day and even if I fell off, it didn’t matter. These guys called it parking, not falling off – I liked that! There’s a great sense of satisfaction in crossing a massive puddle and not falling in. 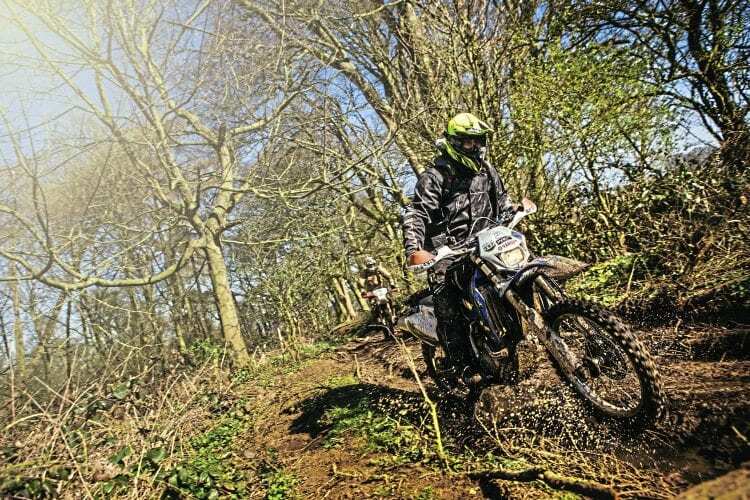 The day with the Lincs TRF taught me a lot about trail riding, and all that goes with it. 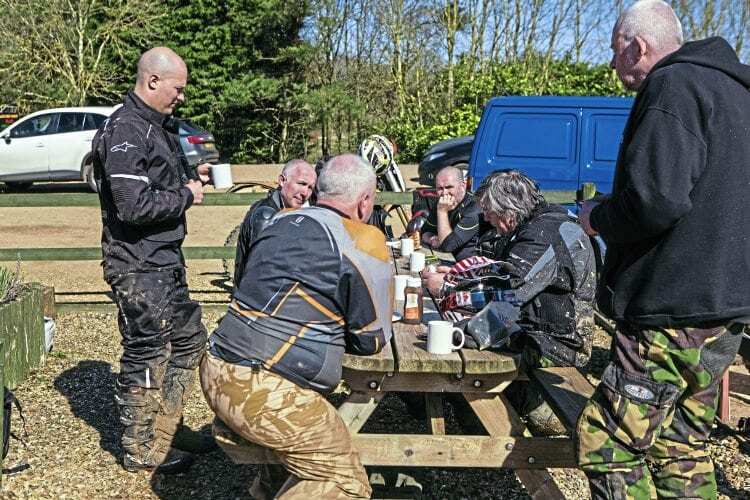 It’s not just about riding, it’s also about enjoying the beautiful countryside, having a laugh with your mates and even getting fit – I was knackered after the ride. The sun might have come out but the bikes were rolling deep in mud. One thing’s for sure, the ride made me certain that I need to find some money to buy myself a trail bike. Now, which of my kidneys should I sell first…? 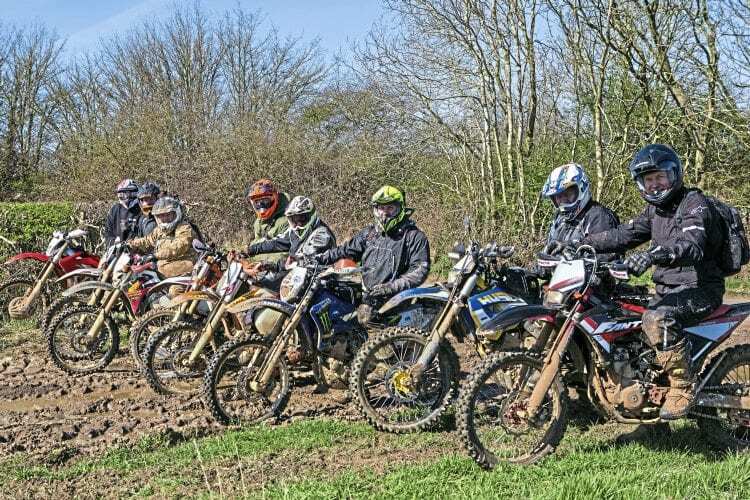 The Trail Riders Fellowship (TRF) has about 40 local groups spread across England and Wales. Most meet monthly, and have their own rights of way experts who regularly lead rides in their own areas. On top of that, there are a wide range of local, regional and national activities running throughout the year. That’s how it’s done. The boyrs from TRF get a lick on. TRF membership costs £45 a year, and comes with a host of other benefits, including discounts on many motorcycle products and services. 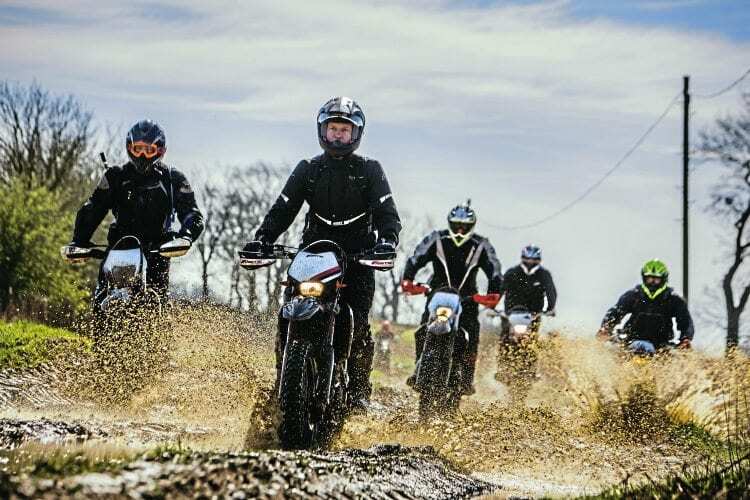 With thousands of members and connections to other motorcycling and countryside groups, the TRF has increasing clout in politics and law. 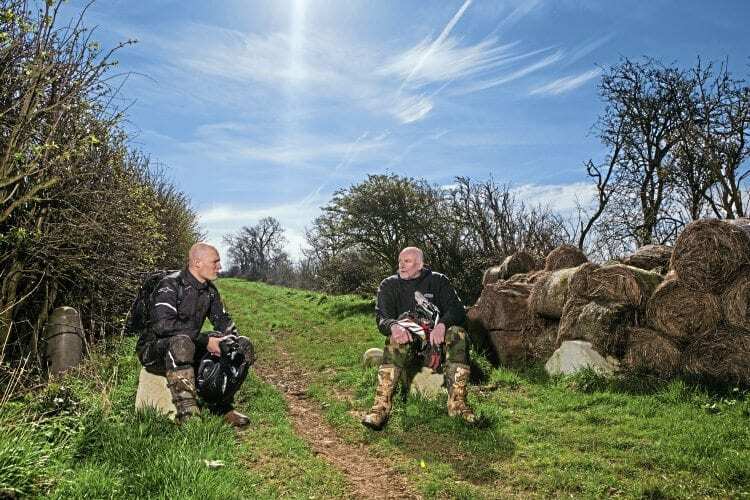 It’s the only motorcycle club actively seeking to protect and promote the right to ride on the UK’s historic unsurfaced road network nationwide. For further information, or to join, visit www.trf.org.uk, or catch them at one of the many motorcycle shows where the TRF exhibits. MSL: How did you get into trail riding and why did you join the TRF? 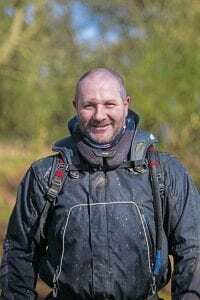 Mark: I started riding in 1977, at the age of 10, on a Honda XR75. In 1978 I got racing schoolboy motocross, and in 1984 I graduated to adult motocross. From 1987 to 1994 I raced quads, winning the 500cc national quad championship in 1988. After packing up racing in 1994, I spent eight years without a bike. Then in 2002 I took my bike test to get a road bike. A couple of years later, after a ride on a friend’s XR400, I decided to get another dirt bike and join the TRF. I bought a DRZ400 and was hooked from the first day riding green roads! Now I’ve been a member for 13 years. MSL: What sort of activities do you do with the TRF? Mark: I don’t ride as much as I would like to. Ideally I’d like to ride with the local group once a month, but in reality it’s more like once every two or three months. I also do about three TRF weekends a year, where we go camping and riding from Saturday to Sunday. I really enjoy those weekends; we’ve been to Northumberland, Yorkshire, Wiltshire and Norfolk. 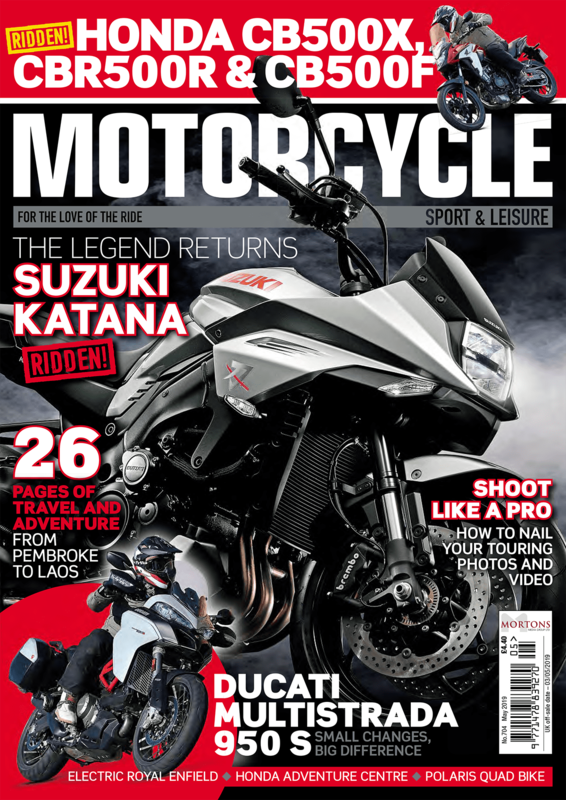 MSL: What do you most enjoy about riding with the TRF? Mark: First off it’s the riding, green roads on a motorcycle. Hove the camaraderie too – the guys always offer help and advice if there’s a problem. And we get to ride through some beautiful – and sometimes very remote – countryside. It’s a challenge and an adventure every time you go out! But it’s relatively safer at slower speeds than riding on the road. 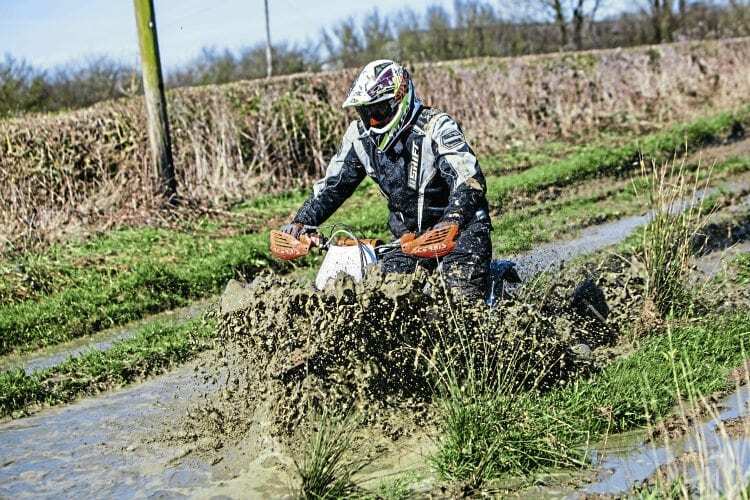 Cleaning the bike took longer than after a road ride – even on Lincolnshire roads.